Abstract sculpture, garden design, set design for Martha Graham, Merce Cunningham, and George Balanchine. 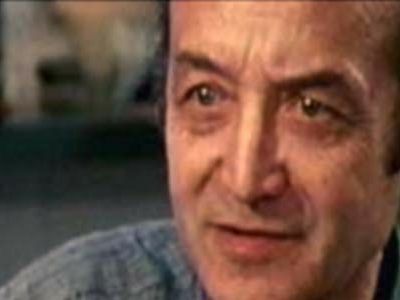 Isamu Noguchi was born Isamu Gilmour in Los Angeles in 1904 to Leonie Gilmour, an Irish-American teacher and editor, and Yone Noguchi, a Japanese poet. It is the cultural divide between his parents, between East and West, between two distinct histories of art and thought, that would engage him his entire life. In 1906, Noguchi’s mother took him to Japan, where he attended Japanese and Jesuit schools. While in Japan, Noguchi gained an appreciation for its landscape, architecture and craftsmanship. Later his mother sent him to Indiana to attend a progressive boarding school she had read about in a magazine. 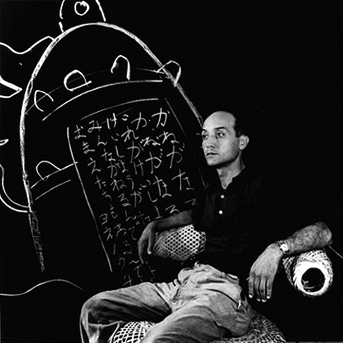 After high school Noguchi enrolled in Columbia University to study medicine, while at the same time taking sculpture classes on the Lower East Side. It wasn’t long before he realized that art, not medicine, was his true calling. He left school and found a studio where he could sculpt full-time. While in Manhattan he became acquainted with the work of the Surrealists and with contemporary abstract sculpture. These interests led him to Paris on a Guggenheim Fellowship, where he met and worked with the great modernist sculptor, Constantin Brancusi. Brancusi’s engagement with the abstract and his belief in understanding the pre-disposed forms of his materials made a strong impression on Noguchi. While in Paris he also met the sculptors Alexander Calder and Alberto Giacometti. Returning to New York in 1929, Noguchi found little acceptance for his abstract sculptures. His sculpted portraits, however, earned him not only a new degree of recognition, but a living as well (among his early patrons was the composer George Gershwin). While these commissions increased his popularity, the work seemed stifling, and in the thirties he moved to Mexico City to work on a large three-dimensional mural with the painter Diego Rivera. While not his own work, the mural was closer in scale to the large pieces he longed to create. His work in Mexico City eventually won him the opportunity to create the entrance to the Associated Press building in New York. With this, Noguchi was able to work on a large scale project of his own. After World War II, Noguchi returned to Japan and found a community of young artists eager to take part in the optimism of his new ideas. He continued to make individual sculptures, but was also given the opportunity to work on larger site-specific pieces. Among these were gardens and fountains which combined his interests in sculpture and architecture. Finally, this return was both a personal and political bridge bringing together two countries who had recently been at war. While his proposal for the Hiroshima Monument was not accepted, his involvement in the cultural exchange between Japan and America was important. For Noguchi, Japan was both his past and his future, providing him with a history of craftsmanship as well as aesthetic inspiration. He would return there constantly throughout his life to work, study, and live. Despite his constant relocation and private temperament, Noguchi found a place among the pioneering generation of modern artists. He was inspired by and collaborated with many of the inventive American architects, choreographers, and painters of his time. With his long-time friend, Buckminster Fuller, he constructed models, planned outdoor projects, and investigated the ways in which people live and thrive in their environments. By creating sets for the choreographers Martha Graham, Merce Cunningham, and George Balanchine, he continued this investigation. He was well respected by many artists, including Frida Kahlo, Arshille Gorky, and Willem de Kooning, but never belonged to any movement or school. Noguchi died in December of 1988 at the age of 84, but his influence continues to spread. His classic designs — notably his Akari lamps and his free-form coffee table — have never been more popular. In New York, weary urbanites take tranquil refuge in the delicate light and shadow of the Isamu Noguchi Garden Museum. On the other side of the world, his work site in Japan is a lovingly preserved record of his creative process. He has gardens in Paris, Jerusalem, and New York, and outdoor sculptures and environments in seventeen American cities. In these beautiful, spiritual, and finely constructed works Isamu Noguchi has created a dynamic testament to the ties between East and West.